International Journal of Research in Health Sciences,2014,2,1,420-426. 1,3-Assistant Professor, 2-Assosiate Professor, 4,5-Post Graduate Department of Community Medicine, PES Institute Of Medical Sciences and Research, Kuppam, Andhra Pradesh, INDIA. Background: Non-communicable diseases are the leading causes of death globally and recent studies had demonstrated that transport drivers are at greater risk of developing cardiovascular diseases due to an incorrect diet, sedentary behavior, unhealthy lifestyles and obesity. Objective: To characterize transport drivers working in shifts through the assessment of clinical and demographic variables and the presence of some cardiovascular risk factors. Materials and methods: Cross sectional study was carried out from July 2012 to December 2012 with transport drivers of APSRTC of Kuppam. 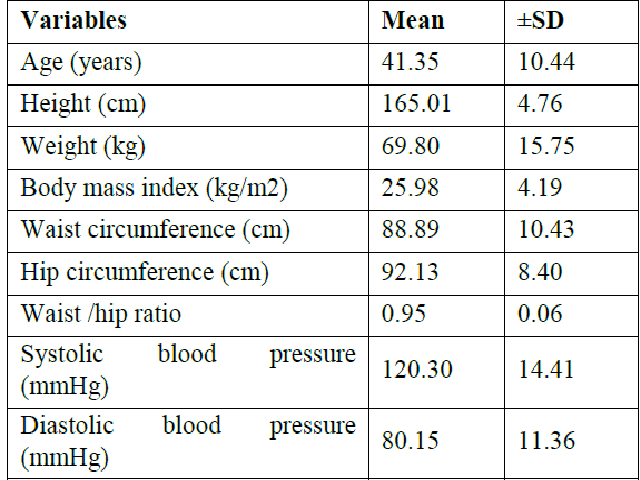 Data was collected regarding socio-demographic profile, diabetes, use of medication, tobacco and alcohol consumption, work schedules and perceived occupational problems and their blood pressure and anthropometry were also measured & analyzed using SPSS software. Results: 244 transport drivers were studied. Out of 114 tobacco consumers 82 were smokers and 32 were tobacco chewers and 139 subjects were alcohol consumers. Perceived reasons for smoking were it suppresses cold (28.04%) and enables to concentrate on work (20.73%). Perceived reasons for alcohol consumption were peer pressure (25.9%) and it suppresses cold (20.1%). Among 244 subjects 36.1% were pre-obese and 35.2% were obese with 22.95% of pre-hypertensive and 18.86% hypertensive. Duration of alcohol intake and tobacco use, BMI, WHR & WC were significantly associated with hypertension. Conclusions: Higher prevalence of risk factors of cardiovascular disease with various perceived reasons and they were statistically significantly associated with hypertension.